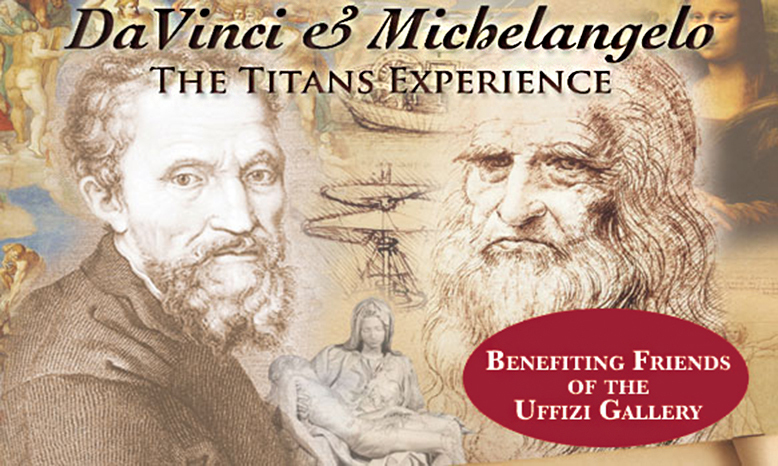 The “Discover DaVinci & Michelangelo: The Titans Experience” national touring theater performance makes its Palm Beach County debut at the Mizner Park Cultural Arts Center on Monday, March 27, 2017 for an Opening Night 7:30pm performance to benefit Friends of the Uffizi Gallery. Mark Rodgers, the creator and host of the multi-media performance, is also the curator of the DaVinci Machines and Michelangelo Exhibitions, from the permanent Museum of Leonardo DaVinci in Florence, Italy. Rogers will take audiences on a fantastic, awe-inspiring journey through the Italian Renaissance as seen through the eyes of these two, monumental geniuses who were not only contemporaries but also fierce competitors. This is a non-stop, multi-media performance includes movies, 3-D animations, and images of DaVinci and Michelangelo’s inventions, machines, images of codices, artwork, paintings, and sculptures. “We are honored to be benefiting the Friends of the Uffizi Gallery for their dedication to the Uffizi Gallery in Florence, Italy to raise awareness of its cultural treasures and to provide resources for preservation, restoration and education of Renaissance art for future generations. DaVinci and Michelangelo would be proud for their support, forward thinking and bringing new, innovative theater, and art to the students, parents, schools, art and theater patrons of Palm Beach County” explains Rodgers. The Opening Night Performance is on Monday, March 27th, 2017, at 7:30 pm and lasts approximately 2 hours and 20 minutes including an intermission. Tickets for reserved seats cost $100 and can be purchased in person at the Mizner Park Cultural Arts Center in Mizner Park, 201 Plaza Real, Boca Raton, FL 33432. 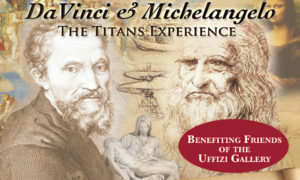 Tickets can also be purchased over the phone at 844-MPCC-TIX or 844-672-2849 or online at www.miznerparkculturalcenter.com Promo Code “Uffizi” when reserving seats.